This Persistence Market Research (PMR) report examines the global botulinum toxin market for the period 2018–2026. The primary objective of the report is to offer insights into market opportunities for botulinum toxin and key developments in the botulinum toxin market. The market for botulinum toxin is primarily driven by expanding applications, approvals of new therapies and approvals in emerging markets. However, counterfeit products remain to be the biggest challenge in the market. The report analyses the global botulinum toxin market in terms of value (US$ Mn). The report begins with the market definition and an explanation of the different product types, applications and end users. The market view point section includes an analysis of key trends, drivers, opportunities, trends and macro factors influencing the global market. The report also presents an analysis of the different regional markets by product, application, end user and country. Representative market participants section gives a list of companies operating in every region, the prevalent competitive landscape and intensity map of key players’ presence in each region. Weighted average selling price is considered to estimate the market size of botulinum toxin mentioned in the scope of the study. The country price is captured with the local currency and then converted to USD to offer forecasts in a consistent currency standard. Furthermore, we have considered the latest annual exchange rate to reflect the impact of the most recent economic conditions of each assessed country. Prices considered in the models are standardized based on the average dosage recommended per procedure. An important section of the report focuses on the competitive landscape to provide report audiences with a dashboard view and to access the key differentiators among the competitor firms. Market structure analysis provides tier wise breakdown of total market revenue. The section also provides company share analysis for key market players. This section is primarily designed to provide clients with an objective and detailed comparative assessment of product offerings and strategies of key providers specific to the different market segments. 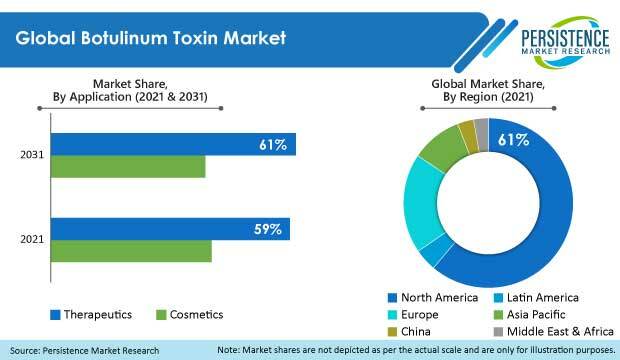 Detailed profiles of players in the botulinum toxin market are also provided in the report with company overview, product/segment overview, SWOT analysis, financial information, key developments related to the market and a strategic overview. Another key feature of this report is the analysis of the key market segments in terms of absolute dollar opportunity. This is traditionally overlooked while forecasting the market. However, absolute dollar opportunity is critical for assessing the level of opportunity that a provider can look to achieve, as well as to identify potential resources from a sales and delivery perspective of the products. To understand key growth segments, Persistence market Research provides the ‘Attractiveness Index’ analysis to help clients identify real market opportunities. Some of the therapeutic indications such as over reactive bladder and muscle spasticity have very few alternative treatment options and these are confined to either surgery or drugs management. Also, certain indications like chronic migraine can be effectively treated with botulinum toxin with the effect lasting for close to nine months. There has been a steady increase in the number of non-surgical cosmetic procedures to treat various conditions. Being non-invasive in nature, botulinum toxin is widely preferred as an effective mode of treatment across various therapeutic indications. These diverse applications of botulinum toxin is leading to a surge in demand from hospitals and clinics and is expected to augment revenue growth of the global botulinum toxin market. Botulinum toxin is used in both cosmetic and therapeutic applications, and the recent trend in the healthcare industry is the adoption of combination therapy. Medical practitioners are incorporating botulinum toxin with other drugs and treatment options in various procedures to provide long-lasting effects. For instance, botulinum toxin combined with aluminum chloride hexahydrate antiperspirant creates a better response to the treatment in hyperhidrosis patients. Likewise, the use of botulinum toxin with dermal fillers has been observed to provide a smoother appearance and longer effect in cosmetic procedures. While botulinum toxin is thought to be largely used to treat cosmetic conditions, the therapeutic applications outnumber the cosmetic applications. Botulinum toxin is an effective treatment option for chronic cases of migraine, muscle spasm, over reactive bladder, and hyperhidrosis. Besides these, botulinum toxin has been found to be extremely effective in alleviating chronic cases of pelvic pain in women suffering from endometriosis. Studies indicate that patients injected with botulinum toxin were able to stay pain free for up to 11 months. Botulinum toxin is also widely used in the treatment of cosmetic applications such as Crow's Feet, Forehead Lines, Frown Lines/Galbellar, Square Jaw/Masseter, and others. However, the market for therapeutic applications is likely to witness rapid growth, with the demand for botulinum toxin to treat muscle spasm expected to surge exponentially in the coming years. Necrotizing Fasciitis is a rare form of deadly disease that eats into human flesh and could be harmful to human life if not diagnosed at the right time and treated immediately. Caused by a number of bacterial strains, this skin infection spreads quickly through the body and diminishes the body’s ability to effectively fight infection. New research indicates that administering botulinum toxin to patients suffering from Necrotizing Fasciitis helps block nerve signals and controls the spread of the infection. The role of botulinum toxin in treating chronic infections is part of new research and innovation studies and this is anticipated to augment market revenue growth in the near future.